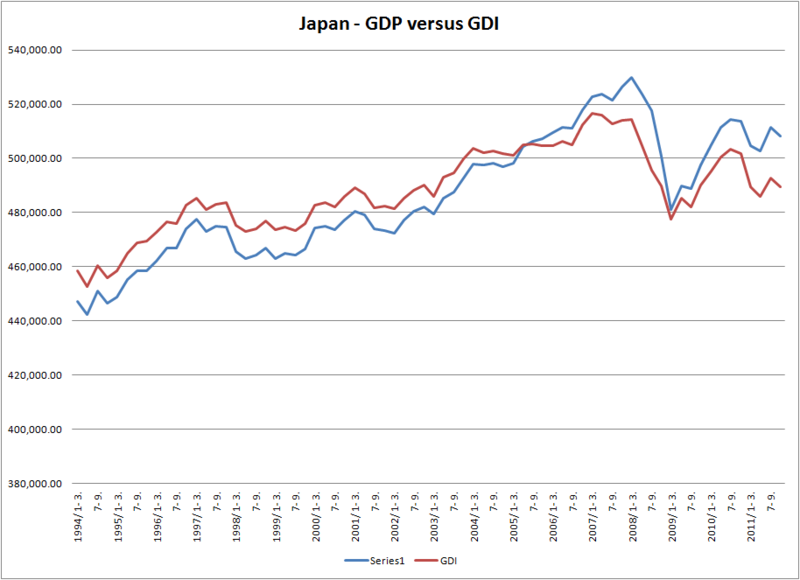 If there was ever an economy so mind bogglingly difficult to analyse it is Japan: low unemployment, low wage growth, low GDP growth, weak consumer demand, manufacturing and export dependent with very important overseas supply chain networks, an aging population, low birth rates, the most indebted developed nation and recently beset with apocalyptical natural and man made catastrophes. 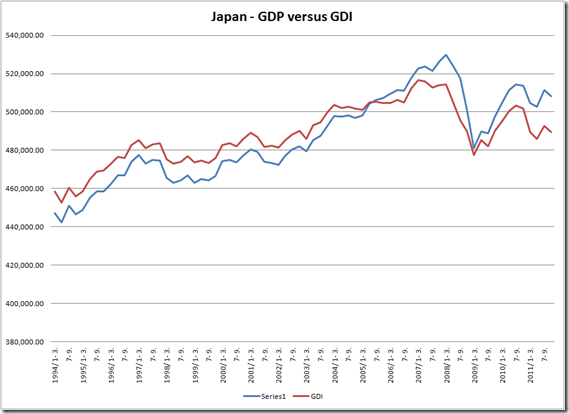 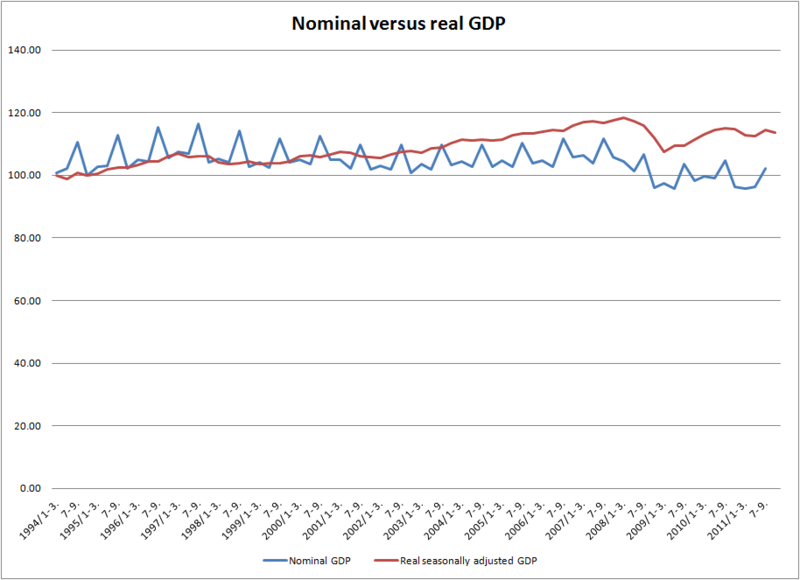 Japanese monthly data appears meaningless unless framed within a wider perspective: take the following chart showing real and nominal GDP (not seasonally adjusted) since Q1 1994. 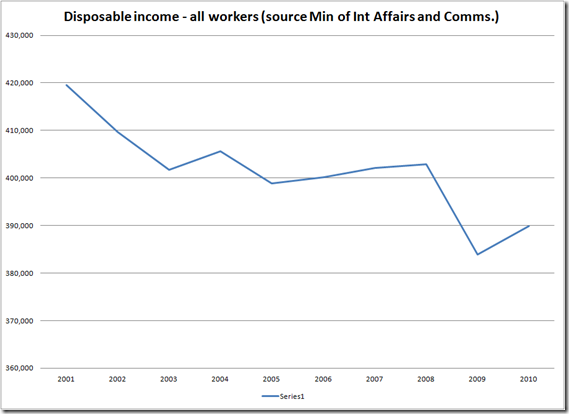 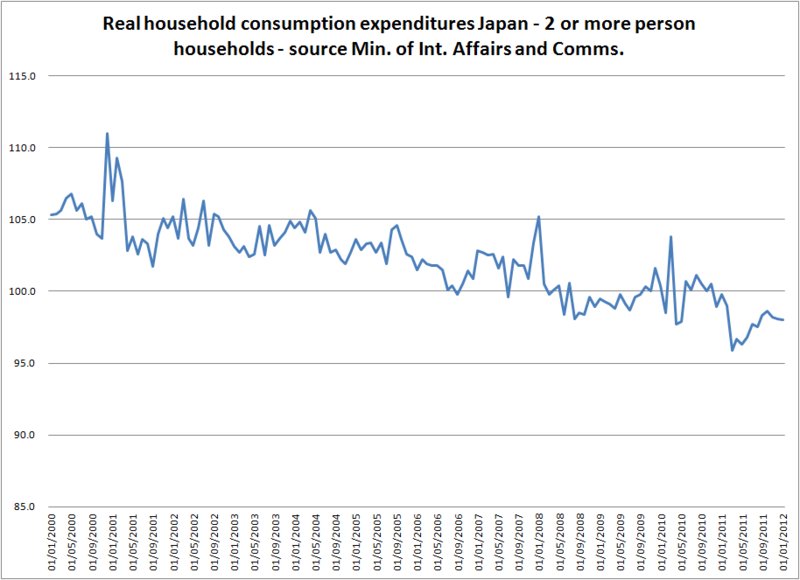 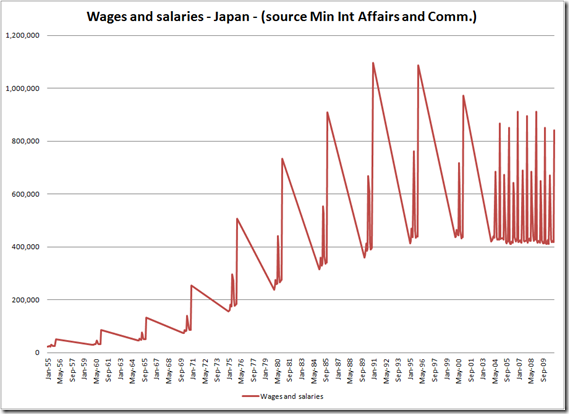 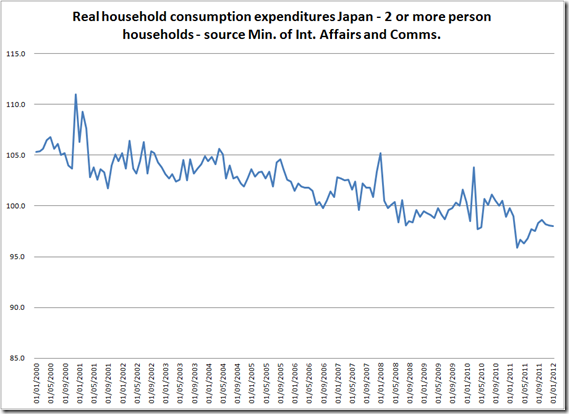 The recent household expenditure survey from the Ministry of Internal Affairs and Communications show household expenditure, for 2 or more persons, down 2.3% year on year in Japan, but the long term trend shows the economic degradation. 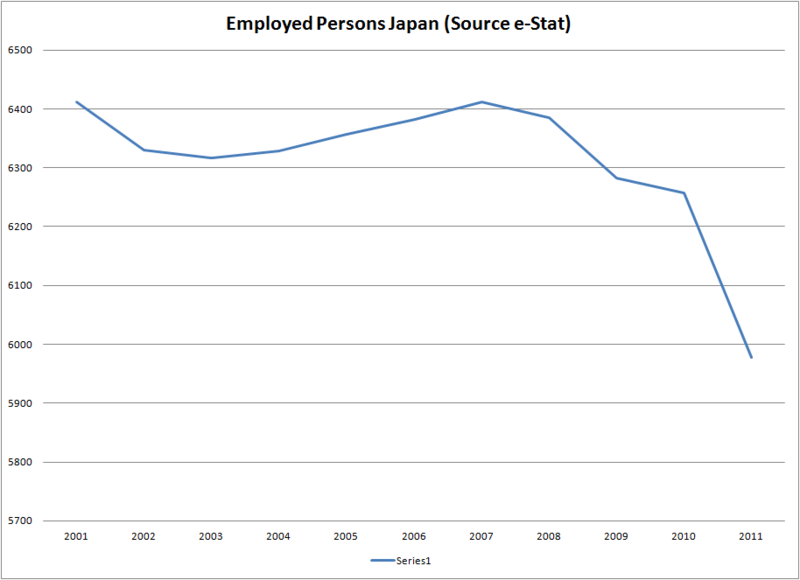 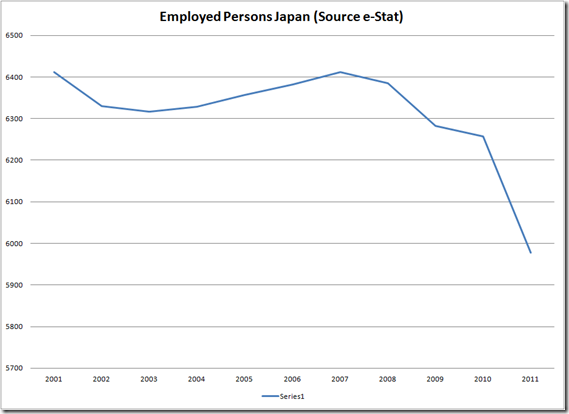 And employment trends have been weak: the following chart shows employment from 2001, although it is worth discounting 2011 data since this excludes data from the nuclear affected prefectures. 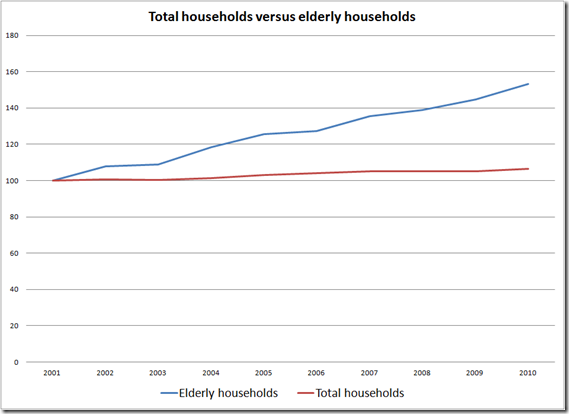 Savings rateshave also declined to levels prevalent in the US and Canada. 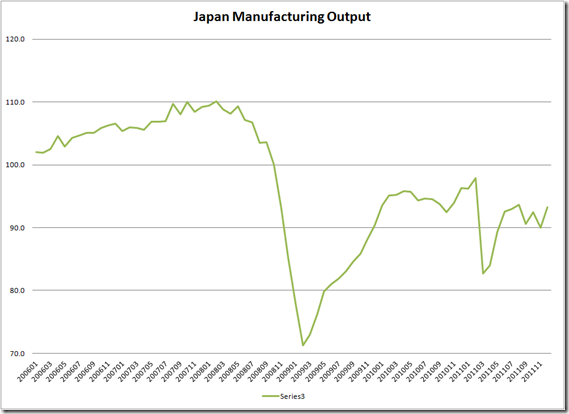 Recent PMI data for Japan has also been weakat 50.5 in February down from 50.7 in January, with PMI and production dynamics having been impacted over the year by the March earthquake and the more recent floods in Thailand. 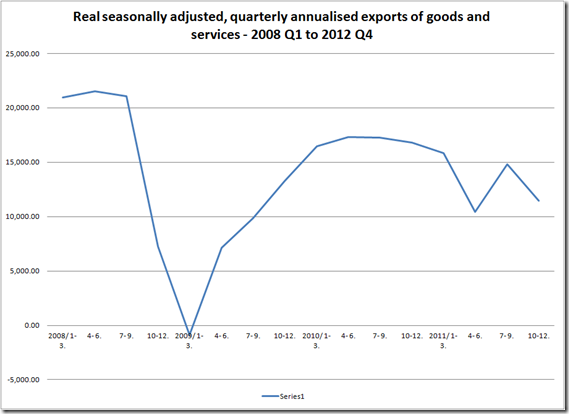 Real seasonally adjusted quarterly GDP fell by 2.3% (unadjusted rose by 2.2%) with declining exports and rising imports the biggest culprit. 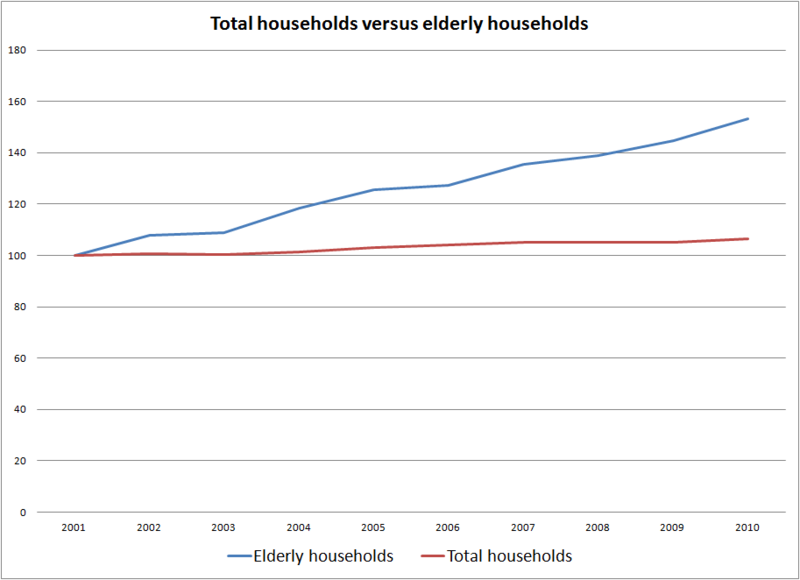 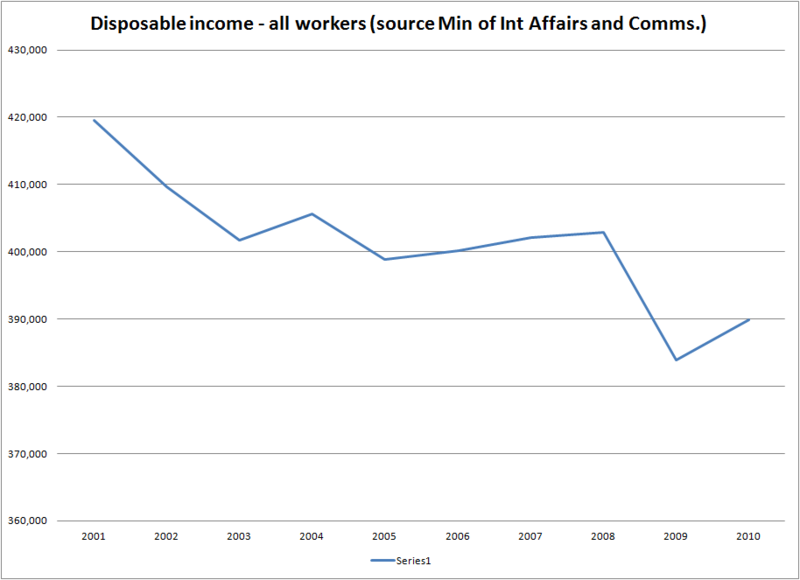 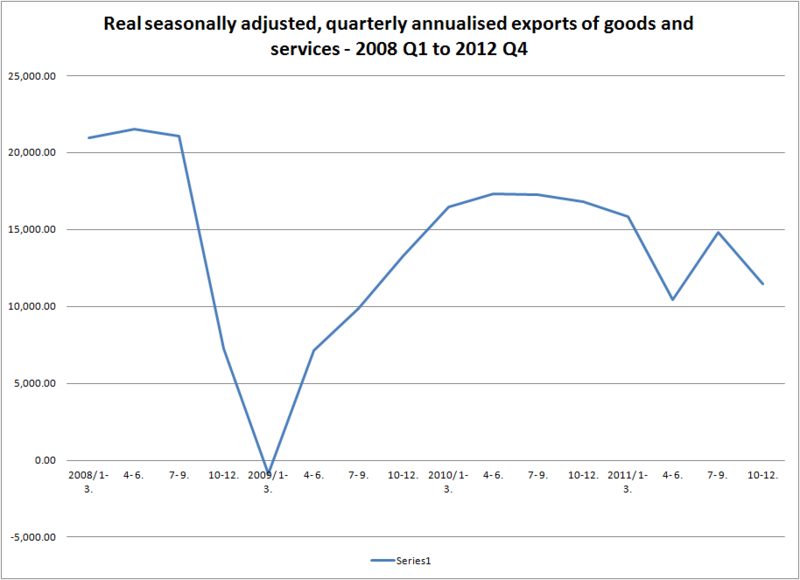 And what do we make of this little chart? 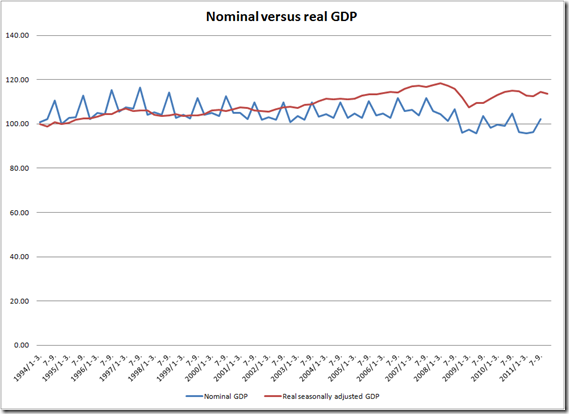 Gross domestic product versus gross domestic income (real, seasonally adjusted, quarterly annualised data). 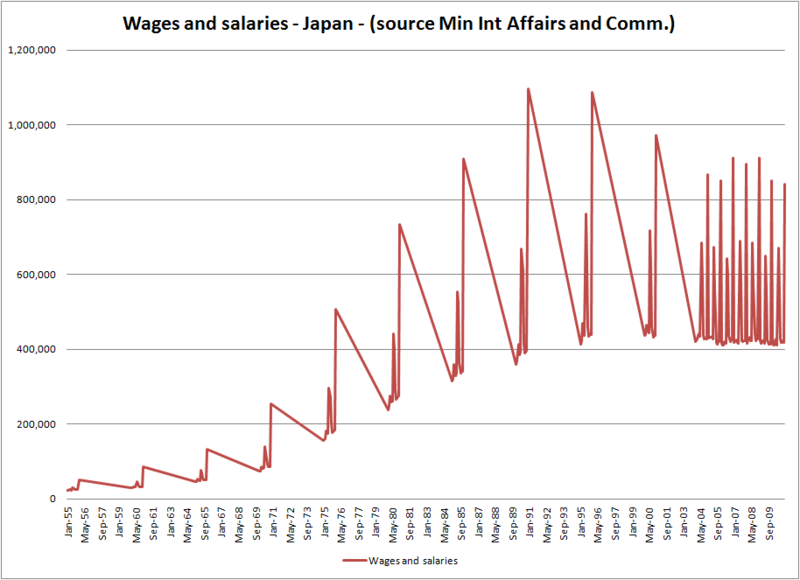 The GDI data certainly matches the trend in wages and salaries, but it also suggests a more fundamental weakness in final demand dynamics. 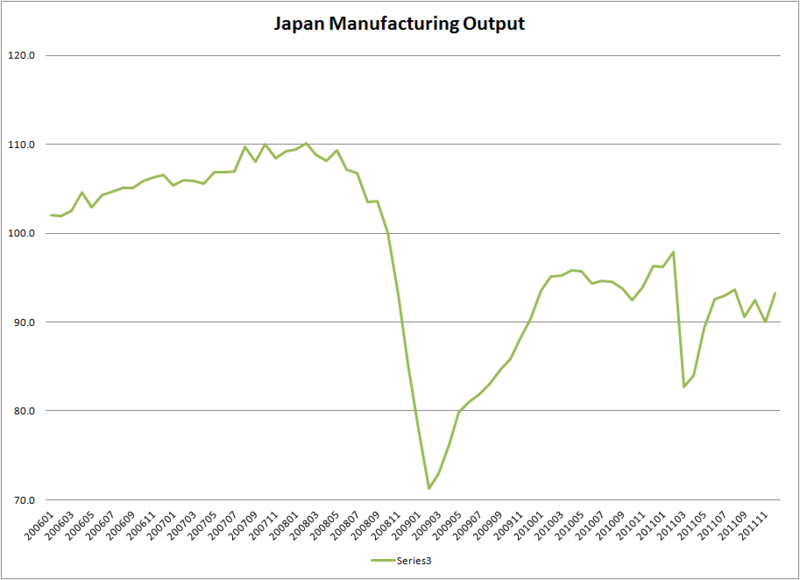 Japan remains export and manufacturing dependent with an increasing portion of Japanese production taking place overseas: domestically it is impacted by significant debt, an aging population and slow growth by consequence, but externally it is leveraged to Asia and domestic demand in Europe and the US.